Not in the UK until 2007, the new Citroen C4 Picasso is going to seriously challenge everything else in its sector and is undoubtedly the best MPV Citroen have ever offered and arguably, one of the best on offer anywhere. To support this, Top Gear Magazine have just awarded the C4 Picasso its “Family Car of the Year” award and 4×4 & MPV Driver Magazine have awarded it their “MPV of the Year” award and all this for a car that at the time of writing has not even hit the streets in the UK. The MPV sector is the fastest growing part of the European car market and shows no sign of slowing, so its of critical importance for every manufacturer to have a car in that class. Citroen launched its Xsara Picasso back in 2000 and since then, it has remained a firm favourite as a value for money mini MPV. 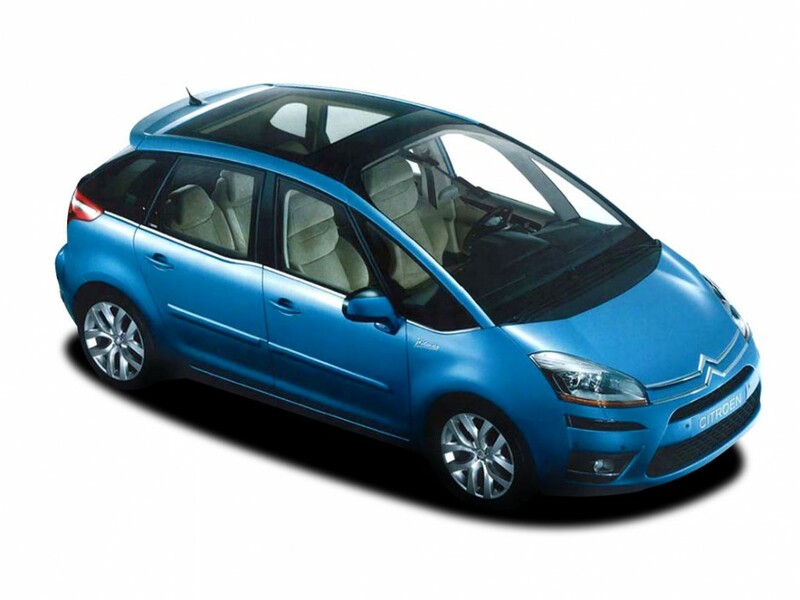 Citroen’s aging Synergie was replaced in 2003 by the C8 to fill the need for a larger MPV. I have to point out that Citroen will continue to make and offer Xsara Picasso. The C4 Picasso is NOT a replacement; it’s a new car offering 7 seats and bridging the gap between Xsara Picasso and C8. We travelled to France to drive the car, having access to every model in the range and covering around 200km on a mix of twisty French Roads and on Motorway so we tested the car very thoroughly. Firstly in terms of appearance the new Citroen C4 Picasso is a much slicker much more modern car than the current Xsara Picasso, its smack bang up to date and its simply bristling with the latest technology. The first thing you will notice is the massive front screen that goes way up into the roof above the drivers head and which Citroen claim doubles the visibility in front of the vehicle. Citroen call this “Visiospace” and I have to say it works, it really adds light space and a feeling of openness, so much so that initially driving the car, you feel a little exposed, but after just a few miles, you wonder why every car isn’t designed like that. Glass is a big feature of the Citroen C4 Picasso and it’s got more than anything in its class, offering exceptional visibility from all angles and leaving the interior bathed in light. Citroen claim the new car has the best three-quarter, side and rear three-quarter visibility in its class and as a result, manoeuvring the car is far easier than it is in any of its competitors. Natural light was clearly a feature of this car, but so is the on-board lighting, with the cabin having no fewer than 32 different sources of light designed to create a warm atmosphere and enhance on-board comfort. The cars instrumentation is nice also, with individual air-conditioning controls set at either end of the dashboard. The parking brake is electronic, but it’s located up high on the dashboard and is so easy to use. You can store a couple of cans of drink in the centre pocket, along with a 1.5 litre drink bottle also and oh, there is a really nice air-freshener system built into the car as well. The steering wheel is even more important on the C4, because unlike most other cars on the road, the centre of the steering wheel does not rotate; it stays in one place and houses all of the main switchgear. At first you might think this is odd, but frankly it’s a masterstroke, it means that everything is so easy to get to – all of the time. Wait and see how many other manufactures go this way in the years to come. Safety is a big feature of the Citroen C4 Picasso and to demonstrate this, it has 7 airbags as standard, including a driver’s knee airbag. To keep the kids safe, all of the electronic controls for the rear doors and windows can be disabled by the driver. The C4 Picasso features 4 Isofix seats, seatbelt warning lights for every seat, front & rear, and even a child watch mirror so the driver or passenger can keep an eye on the little darlings whilst on the move. In terms of security, the new Citroen C4 Picasso rings the bell there as well, with laminated glass side windows (a very rare feature), superlocking, a perimeter alarm, engine immobiliser, tamper proof boot lock and automatic locking when both stationary and mobile. The specification of this car is huge, but to make it easy, depending on specification you choose, here are some of the things you will get. Hill Start Assistance, Parking Gap Sensors, Xenon Dual Function Directional Headlamps, Lane Departure Warning System, Front & Rear Parking Assist, Cruise Control, Tyre Pressure Monitors, Bluetooth Hands-Free Telephone System, Colour Screen Satellite Navigation, Hi-Fi Pack, DVD Player, Panoramic Sunroof. Finally, we should mention the reason you are probably going to want this car and that’s its space and its 7 seats. Citroen have done a great job here. The space between the driver and the front seat passenger is the biggest in the class, making it so much easier for the rear passengers to see ahead. The second row of 3 seats are all of the same width, so there is no one squashed in the middle and importantly, it allows a child seat to be fitted in the middle seat, which cant be done with lots of its competitors which have a smaller middle seat. Legroom between the front and second row is also the largest in its class. Folding the seats down is so easy, just by pulling a strap at the bottom of the backrest. Unlike many other MPV’s the headrests can be left in place making the whole job even easier, whilst the rear two seats just take one finger to stow away. Folding the rear 5 seats away offers a flat loading area from the boot to the back of the front seats. There are lots of positive things to say about this car and at this time, we don’t know of any down sides. Clearly there has been lots of thought gone into designing and building the CitroenC4 Picasso and it seems like Citroen have taken all the good ideas from its competitors in this market, added a whole load of new innovative ideas of its own and the C4 Picasso is the result. At the time of writing, we are not at UK launch stage yet, but The Citroen C4 Picasso has already been voted MPV of the Year by 4×4 & MPV Driver magazine, which also awarded Citroen its MPV Innovation of the Year for the new model’s 32-source interior lighting system. I am sure these are only the first of a raft of awards that the C4 Picasso will win. Obviously it depends on how Citroen price the C4 Picasso as to how many of us order them, but if Citroen can price it alongside its competitors, customers are going to order these in big numbers. Well done Citroen, a good state of the art attractive MPV. Finally, with all of us being much more conscious of green issues, I think it’s important to point out that Citroen has been awarded “Car Manufacturer of the Year” in the 2006 GreenFleet Awards for its long-term commitment to the development and production of fuel efficient, low emission vehicles. Call us or e-mail us for a leasing quotation on any model in the Citroen range.